Cartoon Network's Emmy Award-winning Young Justice television series stars some of the DC Universe's youngest heroes, so it's not a stretch to see a video game tie-in in development. Relatively new publisher Little Orbit has the reins of the game, entitled Young Justice: Legacy. It's an action RPG title and I had some time to check out an early build of the game at Little Orbit's booth at E3. Read on for my impressions. The very first thing Little Orbit made sure to tell me was that Young Justice show creators Greg Weisman and Brandon Vietti would be involved with the game closely. Those who follow the show will know that there's a significant gap in time between the first and second seasons. Young Justice: Legacy aims to fill in that void with some new story details. While Little Orbit couldn't confirm whether or not voice actors from the show would reprise their roles in the game, it certainly sounded like they were doing their best to make that a reality. 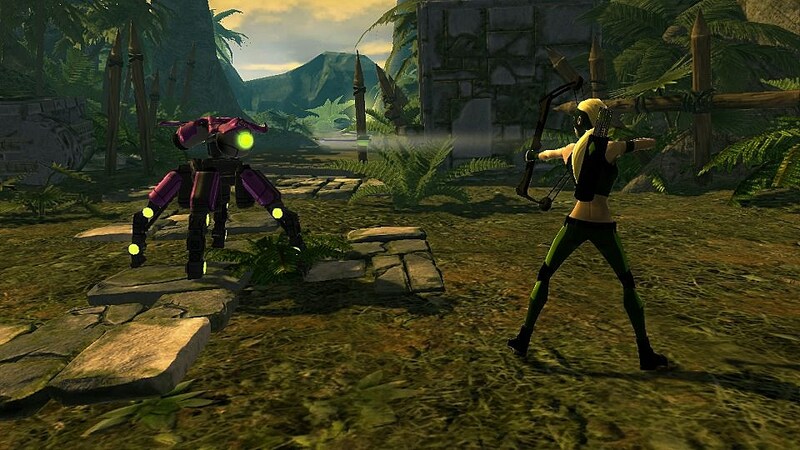 Gameplay-wise, there are many similarities between Young Justice: Legacy and Activision's Marvel Ultimate Alliance games. Play happens from a top-down perspective as you move around mission levels, killing minions and interacting with the environment. The leveling or skill-up system wasn't shown in the game's demo build, but I was told that there would be some sort of character growth and customization system in place for the final game. Unfortunately, those of us who are addicted to hoarding treasure and loot (ala Diablo III) may be a bit disappointed to hear that Young Justice: Legacy won't have a loot/equipment drop system. Personally, I had no problem when Marvel Ultimate Alliance 2 did away with equipment, as managing inventory slots does ruin the flow of the game when you are playing on one screen with friends. 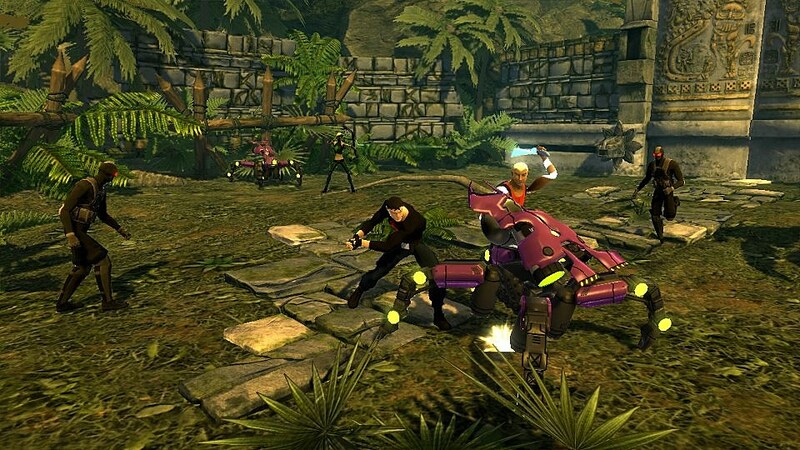 Players can select three Young Justice heroes from a roster of 12 for any given mission. If you're playing solo, you can swap control between any of the characters at any time by hitting the d-pad in each direction. I wondered why Little Orbit didn't incorporate 4 on screen characters at once like most other games in the genre and was told that it was a design decision to cut down on the amount of chaos on screen at once. While the E3 demo had only one controller hooked up, Little Orbit promised drop-in drop-out cooperative gameplay both local and online. 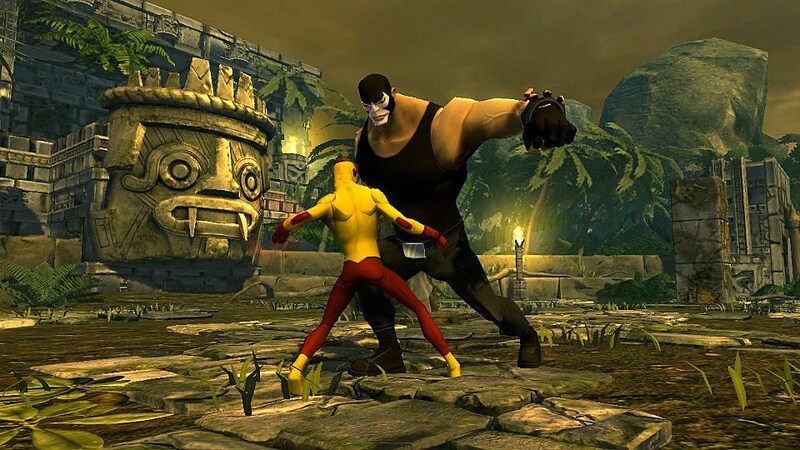 The demo level had our heroes on the island of Santa Prisca fighting Bane and his henchmen. I had a chance to play with Nightwing, Artemis, and Superboy. Combat felt very pedantic to me as I quickly made my way through the level. Gameplay was nothing different from what I had seen before in similar games as I button mashed my way through faceless minions. I knew that there were several powers to activate for each character, but they didn't really make feel like a superhero because they had little graphical impact on both the screen and on enemies. The final boss fight with Bane was anticlimactic as well, as the entire fight was basically "make the big bad buy charge into a pillar so he gets stunned and you can hurt him" type of fight that we've seen since the early days of video games. It was interesting, however, to hear Little Orbit describe each of the characters in a traditional MMORPG sense, by classifying Superboy as a "Tank" or Nightwing as a "DPS." It's easy to imagine Superboy holding an enemy's attention with his invulnerability while Nightwing swoops in from behind and beats the crap out of the bad guy. Though these mechanics are old hat for MMORPG veterans, they do still give a great sense of working as a team, especially if you are playing with someone else. If Little Orbit can figure out a way to work these mechanics for both solo and cooperative play on a console gaming format, Young Justice: Legacy might just be able to pull off what I felt Marvel Ultimate Alliance never really did: make you feel like you are in control of a super hero team. I hate to really judge the game based off the demo since it was quite apparent that it was a very early build thrown together for E3. Character models looked insignificant, environments were not very detailed, and gameplay elements were not really fleshed out yet. Graphically, the game looks like it had a long way to go before even approaching current generation console quality. One of the game's producers even confirmed that there were some elements thrown in there purely for demonstration purposes, such as breakable vases that didn't have anything inside of them. That being said, they did show it in its current form and that was somewhat disappointing. The game is scheduled for release in early 2013, but based off what I saw of the game, I wouldn't be surprised if it got pushed back for more development time. Young Justice fans may want to be cautiously optimistic for the title since the show's creators will be involved. Fans should just hope that Little Orbit is able to create a decent enough game around its story to make it worth experiencing.